These Orange Sweet Rolls are so soft, sweet, and fluffy, you’d never know they’re low fat, dairy free, and vegan with no sugar added! Okay, soooo… I have this Word document on my computer that’s stocked FULL of recipes — recipe ideas, recipes that I have developed but haven’t had the chance to try out yet, and recipes that I’ve made but failed and need some tweaking. The document is 24 pages long, single-spaced, Arial font, size 8. It’s even color-coded and separated into sections, like Drinks, Cakes and Ice Cream. Orange Sweet Rolls have been on my Recipe Wishlist document since 2014. I first saw a recipe on King Arthur Flour’s site and fell in love. And then I came across it again on Averie Cooks a few weeks ago (love her blog!). I needed to make a batch! Orange Rolls are like Cinnamon Rolls but instead of a cinnamon-sugar filling they have an orange marmalade filling! When Cinnamon Rolls have an orange twist, the only option is YES. These Orange Sweet Rolls are super simple to make, packed with deliciously refreshing orange flavor, and they’re made without the butter, oil, and have zero added sugar!! Therefore, suitable for breakfast. Yes, I said it. Breakfast. These Orange Sweet Rolls are so soft, sweet, and fluffy, you'd never know they're low fat, dairy free, and vegan with no sugar added! Preheat your oven to 350 degrees Fahrenheit. Spray an 8×5″ loaf pan with cooking spray and line one way with parchment paper. Pop open the tube of crescent rolls, lay them side by side on a silicone baking mat, and place another silicone baking mat on top. Roll the dough in between the mats into an ~7x11” rectangle. In a small bowl, stir together the orange spread and orange zest. Spread this over the rolled out dough. Roll the dough into a log, just as you would roll cinnamon rolls. Slice the log into 8 rolls. Arrange the rolls inside the prepared pan. Bake for ~25 minutes, or until the edges are golden brown. Spoon over the rolls. Enjoy! **If you're feeling the DIY route, you can also follow this recipe for an "Instant Orange Marmalade"
Drain a can of mandarin orange segments (I got mine from Whole Foods. Make sure they're packed in 100% juice, not syrup!) and dump in a bowl. Mash with a small potato masher. Whisk together the mashed oranges, sweetener, and psyllium husk powder. Let sit for a few minutes to thicken, then spread it onto the rolled out dough. How easy is this 5-ingredient recipe?? Typical Cinnamon Roll and Orange Roll recipes are made with bleached flour, pounds of butter, and tubs of sugar. To make things both easier and healthier, I used 100% fruit orange marmalade spread instead of a butter/sugar/orange zest filling and Immaculate Baking Co’s. Organic Crescent Rolls as the dough. Yep, no need to stress over making a time-consuming yeasted dough — these rolls are yeast-free and don’t need an hour (or two) to rise! And unlike other crescent roll dough at the grocery store, Immaculate Baking never uses bleached flours, hydrogenated oils, or artificial ingredients. This recipe uses natural, organic ingredients. These Orange Rolls are soft and fluffy, sweet and orangey, and oh so good. And no, you’re not strange for having that document…I have the EXACT same thing. Currently working on an extra special recipe for my birthday! I have SO many “potential” recipes – it’s fun…kind of like a to-do list! I have been craving cinnamon rolls for several months now, but I’m trying to stay away from the inflammatory foods like sugar and grains, so I haven’t made any. When I saw this I was like ‘No way! ORANGE sweet rolls’. I LOVE orange. So as soon as I can get some soy flour, I’m making these. I love how you’ve turned something as unhealthy as sweet rolls into something that is so healthy! 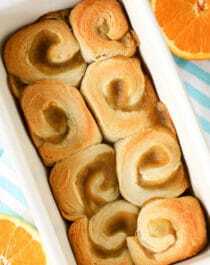 I have to try out the recipe for these orange rolls – they just look so delicious. Once I get my hands on some soy flour I’ll give these a try. But Im going to try a strawberry filling…mmm.. I thought they robbed your recipe first! I was like “Ugh! They stole her recipe!” but then I noticed they credited you. I took it very personally 😛 haha. Just yesterday I reported this Instagram account because they keep posting my pictures and recipes, tagging their logo on my images, and not providing credit. So sad. But they still continue to do it even though I messaged them (they just blocked me instead). I made this recipe today and it was absolutely amazing!! I used the blueberry juice and blueberry purée instead of Orange and it was magnificent!!!!! I would TOTALLY make this recipe any day if I want to cheat for a potluck and pretend that I made something SUPER gourmet and difficult. These look incredible and I cannot believe they are so easy to create! Love the videos! now I have a new hobby thanks to you! really great work and i am really going to try it. Really a good recipe for weekend simple sweet and delicious.and if it works i will recimd it my friends. Are you looking at me funny..and if it works i will recimd it my friends???? This is good because it generally uses organic ingredients.and I really want to made this tasty dish.